A tic is an involuntary movement. A muscle or group of muscles move - tic - when you don't want them to or you make a noise or grunt rather like the throat-clearing some people do when they get nervous. 1) A transient tic, which can be a movement or making a noise that lasts for more than four weeks but less than twelve. 2) A chronic tic, which is either a movement or sound (but not both) that is present for more than a year. 3) Tourette's syndrome, which is movement and sounds together for more than a year. 4) A tic disorder (not otherwise specified) that does not fit into any of the other categories. The classic picture of Tourette's syndrome often seen portrayed in films is the exception rather than the rule. The vast majority of children and adults have a variety of minor motor (movement) tics and/or vocal tics. Although these motor and vocal tics are described as involuntary movements (you can't control them), they can to a certain extent be held back. Some sufferers can stop the tics for a period of time and release them when they are in the privacy of their own home. Therefore, it can come as something of a surprise for a teacher or employer to learn that a child or employee has a tic disorder. Some sufferers can disguise their tics by building them into what might be considered to be normal movements. However, holding back tics comes at a cost. Often when the child gets home his or her behaviour can become very disturbed or they suffer terrible guilt when they finally have to give in to the overwhelming urge. Tourette's Syndrome was originally described by Gilles de la Tourette as 'maladie des tics convulsifs avec coprolalie' (an illness of convulsive tics with the involuntary use of obscene words). 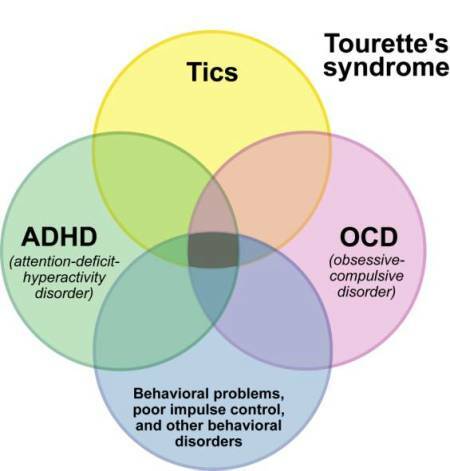 The early documented cases of Tourette's syndrome were of adult patients and it was not until the 1930s that the tics were described in normal children. However, Tourette did note that as well as the involuntary movement tics, vocal tics and swearing, the disorder began in childhood, (usually between the ages of seven and ten), affected males more than females and was, in his opinion, hereditary. He also noted that the tics usually started in the face or upper extremities and that the symptoms waxed and waned and were made worse by stress. The exact cause of Tourette's syndrome is unknown, but it appears to be linked to the gene or genes that control certain neurotransmitters, notably dopamine and serotonin. Where these symptoms begin not only goes a long way towards explaining the underlying cause but also presents an opportunity to provide effective treatment. About a third of people with the disorder have relatives with Tourette's syndrome, while another third have family members with milder tic disorders. There is also more obsessive-compulsive disorder and attention deficit hyperactivity disorder in families of people with Tourette's syndrome. Further, because Tourette's is much more frequent in men, the role of hormones has been considered and it has been suggested that the male foetus might be vulnerable to a spike in the female hormone oestrogen from the mother, during a specific stage during pregnancy. - Just talking about a person's tics - or habits as they are often called - in front of them can set off motor (movement) tics in seconds. - Being overtired can make a big difference to the occurrence of tics. Children are often worse at the end of term. - Lack of sleep can cause an upsurge in symptoms. - Drinking alcohol can make symptoms worse the next day. - Stress is certainly a big factor. In children the build-up to exams or in adults the period leading up to a big presentation can see an increase in symptoms. - Diet has also been implicated on numerous occasions. The Mental Health Foundation has suggested that food additives and insufficient omega-3 can play a role in the generation of anxiety and signs of ADHD. - Being distracted by something enjoyable or engaging in an activity (e.g. playing piano) can see a complete cessation of tics. - Getting enough sleep and taking exercise in the fresh air can help prevent a build-up. - Taking alcohol in moderation. - A healthy diet as free from artificial sweeteners and additives as possible has been shown to help. - Supplementing your diet with omega-3 can also provide significant benefits. ~ The above is from Pauc, R. (2008) Could It Be You? , a well worth reading book for anyone interested in the area of learning difficulties. It's written in a very reader friendly format, detailed but not too taxing on the mind, and covers a range of issues from dyslexia, dyspraxia, ADHD, OCD, Tourette's syndrome, and autism. Recommended.